Here are some options we have for solving hosting a monitor in a backwall, with laptop nearby in a trade show booth display. 1st, rather than having the monitor corded to the laptop, one possibility is using a wireless device such as apple’s appletv or google’s chromecast; that frees up where you put the table/podium to hold the laptop. Now on to how to host a monitor on a backwall. That product is $1740 but includes all you see except the monitor+mount (case-to-counter in front including graphic wrap and the small counter in the back perfect for putting a laptop) even the lights are included. The monitor mount is $80 and hooks onto the edge of any panel any height; so can be on the side or middle as shown. a LARGE monitor 32-40 can be mounted in any of these ‘Waveline Media’ displays. $30 option for the kit to mount the monitor as shown in the picture above. Oyster 10 ft WaveLine Media Display [Kit] • APG Exhibits $1740. (plus $80 for monitor mount). 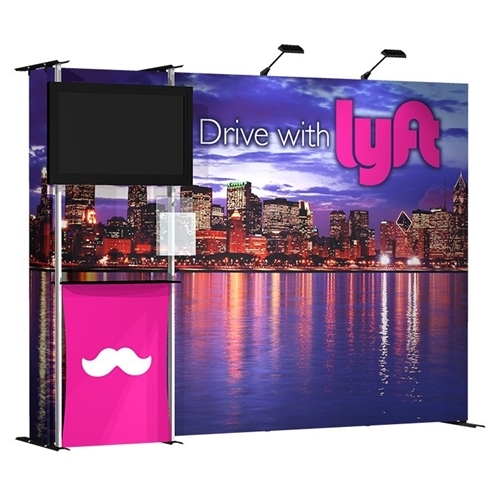 APG Exhibits has numerous options for helping to meet your needs and budget. For additional questions contact customer service.